Kfirim Getting into the Swing of Things! 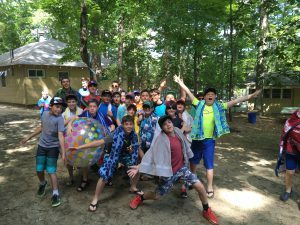 After the second morning of Chugim, the chanichim (campers) got ready for Shabbat on Friday afternoon by dressing in their finest clothes and preparing for the Day of Rest, when the Shechinah (a holy presence) descends upon our beautiful machaneh (camp). Even though gusts of humid wind threatened thunderstorms, the rain held off and we were able to remain outdoors at the Gilboa Amphitheatre for Kabbalat Shabbat and Ma’ariv (Shabbat evening services). After a delicious meal, the kids joined the rest of camp for Shabbat zemirot (Shabbat songs) and went to sleep. The next morning, after Tefillah (prayer), all chanichim enjoyed a restful and fun afternoon of free time. Some chose to swim and play sports, while others read, napped, or played cards and other table games. After Havdallah and Rikudei Am (end of shabbat and Israeli dancing), K’firim returned to their tzrifim (bunks) with their Kerem, who put the kids to sleep and told them a story. Sunday was Yom Debbie, a celebration of Debbie Sussman, the director of camp. She is retiring after this summer, having served as director of Yavneh for 26 years. Because of this momentous occasion, a new Sefer Torah was commissioned earlier this year, and was dedicated on Sunday. The chanichim got to dance with the new Torah, and parents and alumni joined us for the festivities. It was a great day celebrating the 4th of July, Debbie, and Talmud Torah (learning torah) all in one. It culminated with a fireworks show. Today we wrap up celebrating the 4th of July, because it actually is July 4th. There will be cupcakes arranged and frosted like an American flag, and an all-camp talent show. That’s it for now. Tune back in next time for more updates on our good times here in Aydat K’firim!! !